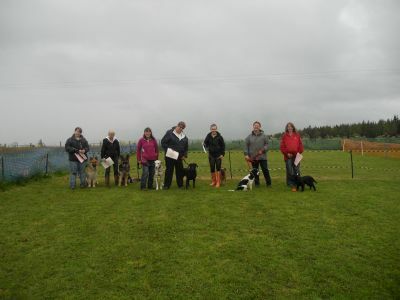 Canine Concerns is a well established Dog Training Club based on the Black Isle just outside the Inverness area. We run Life Skills Classes, Kennel Club Good Citizen Awards and fun classes & workshops such as Flyball, Agility, Trick Training, Keen K9's and Scentwork. Clicker training is also supported. Canine Concerns also offers a reliable, friendly & professional DOG WALKING & PET CARE SERVICE in & around the Inverness area. There are some spaces currently available for dog walking depending on location. For further details visit the Dog Walking Page. You can also join us on our Facebook page! Robert & Kirsty are delighted to serve the dog owners of the Highlands as Canine Concerns Dog Training (& Dog Walking) & pledge to provide fun, adventure and education to dogs & owners. We have always shared our lives with dogs & for the last 9 years Canine Concerns has been part of our lives inspiring us to continually learn, read & research dogs & dog training, in order for us to understand our dog’s minds & how they work. Our love of dogs has led us to compete in obedience competitions, pass the Kennel Club Good Citizen Scheme to gold level & enjoy flyball, agility & scent work with our own dogs. Our dogs have endless amounts of energy & we love to take them on big adventures, taking in the scenery up mountains & through valleys. We hope to meet you and your much loved dogs soon. Dogs do what comes naturally to them as dogs. We as owners want a dog who can happily fit into society & the lifestyles we lead. This often creates concern regarding our dogs behaviours, but the best way to resolve a concern is to take action & look for a solution – kind, effective training. Often the cause of a "problem" or concern is a break down in communication between you and your dog. Understanding and training your dog is about learning to meet the needs of your dog in all areas of your lifestyle. How do you feel about your dogs’ behaviour? Jump up at you or other people? Is fearful or nervous in certain situations? Do you wish you could understand what your dog is trying to tell you? or why he behaves in a certain way? or do you just want a well behaved, happy dog, who is fun, and part of the family? – we can help you to enjoy your dog & your dog training journey. Canine Concerns is a Kennel Club, Listed Status Club. Qualified instructors certified with the International Animal Behaviour Training College (IABTC). 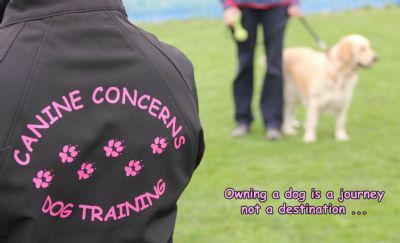 Instructors are Talking Dogs Scentwork® Accredited Trainers licenced by Talking Dogs Scentwork® founder Pam Mackinnon. Qualified Scentwork UK trainer levels 1-4. Full members of the Pet Professional Guild, committed to science based, results based, force-free training & philosophy. Members of the Kennel Club Accredited Instructor (KCAI) scheme (working towards accreditation) & adhere to the KCAI scheme Code of Practice. Volunteer staff are highly experienced dog owners. Agility, Flyball, Scentwork, Trick Training & Keen K9's classes. One to one training for behaviour problems. All the training is based on kind, effective reward based methods. Canine Concerns can help you understand and enhance your relationship with your dog and adopt training methods which work for life. Classes are underway. The next block will commence in April (dates to be confirmed). Life Skills, Good Citizen, & Agility this session. Please use the form on our “contact us” page to express interest – we would be delighted to welcome you to class.